Readers’ Forum: Initiative or exploitation? Home » Readers’ Forum: Initiative or exploitation? Have you ever tried doing the job in the interview or presenting a brief business plan to demonstrate that you are worth hiring? What happened? Did you get exploited? Readers' Forum: Avoid disaster - check out the employer! Nick, your reader may be taking your advice a bit too literally. I don’t think you mean a full-blown business or strategic plan that a team might spend weeks or months on. I think you are talking about doing some solid research and due diligence before an interview. I would imagine, and hope, that the people reading you are not teenagers interviewing at the local McDonald’s or Safeway, but are people pursuing substantial career opportunities—of course, people should invest some serious time and energy into preparing for that first meeting, anywhere from a few to several hours, at least. In my searching, the approach is a bit different—my field is in public affairs (campaigns, community and government relations, lobbying), where demonstrating a thorough knowledge of the issues, the politics and the players is much more important than presenting a specific course of action. I will spend serious time researching in advance of any meeting—thank God for the web! In the old days, it took a lot more legwork. Although human intelligence is done the same, old fashioned way, by calling people up and asking them questions. 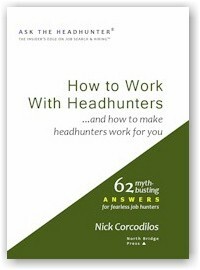 So, it’s 2.17am and I just saw my weekly Ask the Headhunter Newsletter. Larry got it … perhaps the person read this in black letters. When you’re in the job hunt, the game is to read between the lines. Your reader triggered a memory of a Stargate SG-1 Episode/Season 9 when the new guy finds out that the team disbanded and he has to pick a new team to work with off-world. Nick advises (and this HAS WORKED for me) us to do something that demonstrates our ability to perform the tasks in the job or that we are knowledgeable of what the work involves. There was a book I read once that said, ‘Never arrive at an interview empty-handed.’ which reminds me of the same “bring your host a little gift to show your appreciation for the invitation” that, well some of us were taught (I’m from back East). I have prepared a short slide deck (no need to advertise for the app vendor, right? — there are many choices) and by the time I get to slide 3 or 4, the interviewer is excited and ready to work with me. P.S. Yes, do the research, too! Do you want to land a job at a place that is on its way down or doesn’t suit you in activities or practices? I also did not understand the intent\the thought behind the question. The technique outlined by Nick is just an epitome of good interview preparation. Extrapolating and trying to find the legitimate side of the person’s question, it is possible that they sat on the opposite side of the bargaining table from one of my former bosses. My former boss was a fan of getting something for nothing. On one particular project, we wanted to launch an ‘Internet site-in-a-box’ product. He approached the top 3 local companies already in the market space as a potential customer (we had popular online properties at the time) and obtained their market research and strategies. He then had me use pieces of their work to form our own strategy. The way he saw it, he was saving a ton of money on market research and planning time. His business is now defunct by the way. Maybe the person asking this question is coming from this mindset. Three years ago my research proved faulty. After accepting a position with a local company it was evident that the internal ops as conducted by leadership of the company were going to sink it. Three months later I left after the operations exec left. Shortly thereafter the company was on life support. How could I have done a better job investigating this company? 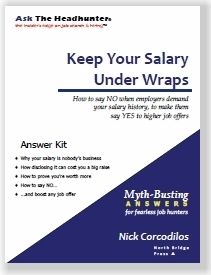 I don’t think he means (Nick) is exploiting, I think he refers to a savvy possible employer is exploiting his candidates. By picking the brains of less sophisticated candidates he is getting free advice without paying for it. But then you get nothing for nothing. I feel you’ve exploited me consistently in the year I’ve been a subscriber to your newsletter. Without remorse or hesitation, you’ve exploited my ignorance of sound personal preparation technique, savvy job search tactics, and common sense attitudes about me and my career. You’ve done this to every single subscriber. It’s really is shocking. You’ve used your own knowledge and experience to convince the less informed that they can “do it themselves.” The idea. Where is the place for the government-funded career centers in your crazy “self sufficiency” mantra? Where is the special government “community organization” to provide me with basic advice about job hunting – like how to hide my underaged child workers, and skip paying taxes? Really, Nick – that you’d have been so blind all these years not to see the exploitation more clearly. As Brian said, exploitation by conning someone into doing free work does happen. Design competitions are often used that way but it is done sometimes in job interview, too. One way to know if the company is trying to get something for nothing is if they ask you to give them those fine ideas you discussed in the interview in writing. Don’t do it. “Doing the job” in the interview is a sound strategy provided it is done in the right way and at the right time (as Nick has consistently stressed). For example, doing a demonstration in front of a HR wonk instead of a hiring manager could backfire. Also, doing it too soon in the interview process could make things uncomfortable–you could come across as bossy, or worse, arrogant (what makes this guy think he can walk in here and solve our problems?). Context and timing are very important. Moreover, it should be just one tactic in your arsenal–it is not a panacea. @Jeff Gumina: 2 ways you might have figured out what was wrong. First, you could have asked to meet managers of depts “upstream & downstream” from your dept. That is, managers whose output would affect your dept and vice versa. My guess is you would have seen cracks in the corporate veneer. Second, you could have talked with some of the company’s customers and/or vendors. If there were problems, those folks would be feeling them already. Job hunters don’t often think to check a company’s reputation “on the street.” It’s key to understanding the condition of the company. Exoloited? He has to be kidding. I do wuite a bit of consultation, and one of the things I am often asked, in so many words, is “What do you do different?” — In effect, what am I bringing to the person/company that they don’t already have? If I can’t offer that, why should they hire me? As Nick advises, I don’t give so much information they don’t need to hire me — but certainly enough to lead us into a working relationship. RIGHT ON, NICK. In my experience some people are determined to see the negative in any situation. Some job hunters find it more comforting to think of all the reasons a possible strategy won’t work as opposed to trying it out to see if it does work. Frankly, the first one is safer. And it sure is easier. If I don’t have a job because of Nick’s bad advice then it’s not my fault. 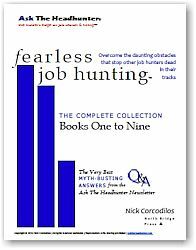 For those who are interested in taking control of their job hunt and being responsible for their own reality, Nick offers sound advice. EXPLOIT ME? I laughed when I read this! Exploit me like this all day! Through Nick’s articles and our communications I have elevated myself from a warm body to a well educated interviewer who KNOWS she is bringing value to the company and can prove that ON THE SPOT! I had one particular company so impressed with my work that they asked to keep it to show it around. My antannea shot to the sky like lightening…and for some gut response reason I decided NOT to leave my work. Sure enough they did not offer me a job but I learned they promoted the interviewers personal assistant to the job. Thank goodnes I did not leave my roadmap for them…Three months later I saw then advertising again for the same job. As they say…you can lead a horse to water yada yada yada! Some business people just do not get it! The only problem I have found with this approach is that some people are put off / intimidated by this approach….but that just tells me I am not in front of the correct person or at the coprrect company…even so, that hiring wall is mghty hard to break through. Would a company use its resources to interview people just to get free ideas? It’s more likely that the company is interviewing so that it can HIRE someone who can both come up with the ideas AND carry them out. But this question brings up something else I’ve been struggling with as I’ve tried to move into a new field: actually doing free work to build a portfolio and reputation, either as a “volunteer” (for a nonprofit) or an “intern.” I’d like to see Nick (or others) address this subject. @TJ, @G: Well put. Caution is good. @Karen. Exactly – if they want your work, and you want the job, it’s time to talk business. None of this leave-it-with-us-so-we-can-get-your-work-for-free crap. There are a few problems with trying something like this in my field to some extent. I work in IT as a web developer where generally what I’m doing requires some background to give me enough bearings to do the work so it isn’t that easy to give me a slice of what I’d be doing on the job, really. I wonder what would happen if I did try to pierce into the work at the interview stage as I imagine if not presented properly it may seem like I’m arrogant or jumping the gun. For some types of work this is a fine idea. In general though, when you are one of a handful on a team, it isn’t that easy to break off a bite-size chunk of work. On the other hand, one could give me various problem situations and see what I’d do and that I have seen in interviews, the “What would you do here?” kinds of questions that can be good if there is enough give and take on them. I don’t like being asked 101 questions and little follow-up happening to tell me if I’m killing myself in the interview or not. 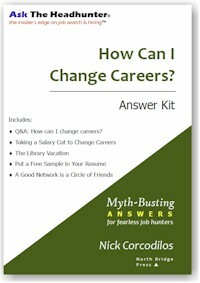 Ellen S, about moving to a new field: It’s tough because you have to prove you can do the new job. I don’t think internships work except for kids starting out and you want to be careful about volunteering so that whatever you do works for you as well as the charity. What you need to do is extend the idea of doing a little of the job in the interview to doing the job without being paid for it but in a way that’s professional and provable. If you want to get into marketing, for example, think of a local organization that needs a marketing campaign, develop it, propose it, carry it out, and then put it on your resume with the name of the organization. It could be a local charity, or your brother-in-law’s restaurant, or an open-source web application, or whatever as long as it’s somewhere that’s a real organization that will trust you to do the work for them. When the project is done, you have experience in the field. This doesn’t work so well if you want to become, say, a financial analyst because no one will trust an outsider with their data so in that case think of the skillset you need. 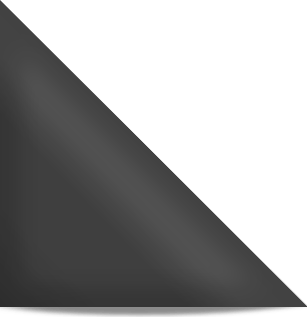 Can you prove you’re an ace at Excel? If you teach a course on it at a community college or run an Excel advice column on the web, those are things that you can put on your resume and talk about in interviews to prove your expertise. And if you’re a web developer you would have a web site for yourself or some organization that demonstrates your skill at developing whatever type of web site functionality you specialize in. On exploitation? You take the risk. If you want to show them your goods instead of bullshitting them, then toss this crap aside and give them something to work with at the moment. In addition, I just do not understand the fear of appearing arrogant, or the idea that you can be “overdressed” or wearing clothes that are too expensive. If you are a certain way or dress a certain way by doing otherwise you are being a fraud. It will be a better fit all around if you are yourself, and show your talents right from the get go, with a take it or leave it attitude. Nick, as usual by the time I finally catch up with a posting the waterfront has been well covered so not much to add. At some point we all have to make a choice as to our willingness to trust. Even though like all of us I have been burned from time to time, I still remain convinced that when it comes to employers the vast majority would not take advantage of someone who “showed them how they would solve their problem.” Indeed, I would side with Nick and others who would argue that they would want that person on board ASAP. After all, they wouldn’t be looking if they knew how to fix it themselves. One of my CEOs used to pay the top candidates for a couple of days of work – further opportunity to demonstrate your stuff, and no exploitation. Perhaps not practical in organizations like IBM or Oracle, but worked in small business. @Marcia: Now THERE is a progressive organization. Thanks for sharing that. It’s not such an outlandish idea. We’ve discussed it here before. The best interviews I ever had that resulted in offers were as a result of having done some spot labor previously for the company as a 1099 contractor. This was, I thought, enough information to convey to anyone competent to evaluate system administrators that I was qualified for the position in question, and since the bit about “I can’t tell for sure without access to your network” was the truth, it was also as helpful in their problem as I could possibly have been at that stage of the process. A day and a half after I told them this, the very public and visible problem I’d attempted to diagnose disappeared, and I never heard from them again. This is as close to the original writer’s model of “exploitation” as I believe is plausible in an interview situation. And while I think it’s (in some cosmic sense) unfair that they’d use my insight, proffered in the context of a job interview, and then not even proceed to the next stage of the interview process (let alone actually hire me or pay for my effort), the actual loss to me was zero, because the “work” I did for them cost me no money, and no time for which I had a more productive use. And the lesson I learned (that this is a company which does not truly value the contributions of IT professionals, or their time) may have saved me considerable heartache. I would undoubtedly have been MISERABLE working there, if they’d offered me a job. So my advice is, if you are exploited in this way (and you may be), count it as a cheap learning experience. No business can subsist on exploitation of this particular variety, since they’ll never be able to go back to the same person twice, as they would with an employee. Any business which would exploit a candidate in this manner will surely exploit their employees far more destructively, and the candidate is better off for having been warned away at low cost to himself. Meanwhile, firms that offer candidates the chance to prove themselves this way (oh, how I wish there were more of them!) seem to me far more likely to treat those people’s skills with deserved respect once they become employees. Not many companies will use interviews to steal ideas. But you don’t really know who they are until you meet them. I love your attitude. While it stings to be used without being paid, the bigger picture is that you know who the bad guys are. Word gets around. There’s nothing like a company’s professional community to sink its reputation when it does something stupid. Thanks for posting the story. claiming he’s exploited needs medication. he could stand up and leave. Admittedly this takes gumption and initiative. I give mr beefer a 1 out of 10 points.